Lay Analysis: Life Inside the Controversy chronicles the history of nonmedical analysis in absorbing detail. It begins with the events of 1910 in Europe and America that initiated their divergent attitudes and policies regarding lay analysis, proceeds to the unfolding struggles over this issue on both sides of the Atlantic, and reviews the halting efforts of the APsaA, beginning in the 1950s, to reassess its opposition to lay analysis and make some provision for the training of nonmedical practitioners. Wallerstein's illuminating treatment of the response of American nonphysician therapists to the APsaA's policy - the manner in which they managed to obtain clinical psychoanalytic training despite the APsaA's prohibition - forms a fascinating story within his grand narrative. The book culminates in a comprehensive review of the lawsuit of March 1985 in which four clinical psychologists, representing a stated class of several thousand colleagues and fully supported by the American Psychological Association, brought suit against the APsaA and IPA, hoping in this way to force a change in the APsaA's policies regarding the training of lay practitioners. Wallerstein, drawing on the voluminous documentation to which he had full access - memoranda, correspondence, depositions, legal briefs, and phone conversations - reviews the three-and-a-half-year history of the lawsuit. He concludes his narrative with a measured and thoughtful assessment of the impact of the settlement on psychoanalysis today: the changes it has brought about within organized psychoanalysis and the meaning of those changes for psychoanalysis as a discipline. 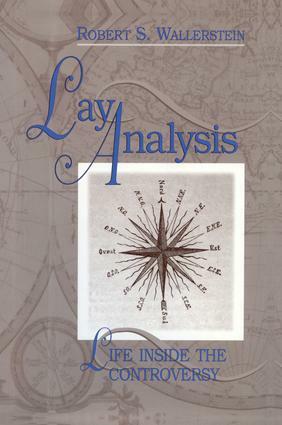 Given Wallerstein's comprehensive scholarship, his admirable even-handedness, and his unique participatory role in the lay analysis controversy over the course of his career, it is unsurprising that Lay Analysis: Life Inside the Controversy should achieve distinction as a major contribution to the institutional history of psychoanalysis. The Confrontation from America and the "1938 Rule"